Eola is a Breton nightblade initially found in the Hall of the Dead in Markarth where she reluctantly resides to satisfy a very special hunger. 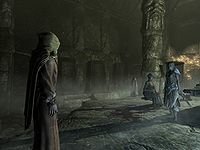 Due to the desecration of the corpses, the hall had to be closed down and you are asked to investigate further, leading to the quest The Taste of Death and an encounter with the Daedric Prince Namira. She can be recruited as a follower after clearing out Reachcliff Cave and becoming the Champion of Namira. She is a skilled mage with a wide array of spells at her disposal and the perks to match them. Additionally, she wields a steel sword and carries a hunting bow with twelve steel arrows. In addition to her Restoration spells, she carries up to three restore health potions along with some food and gold and some common items and gold. She wears studded armor with a pair of hide boots. 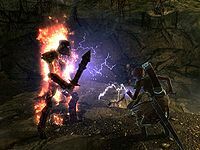 Eola will only show up in the Hall of the Dead once you have spoken to the faithful priest of Arkay, Brother Verulus, who will ask you to investigate the hall and hand you the key. As soon as you enter the crypt, Eola will seductively speak to you from what appears to be inside your head: "Not many would walk blindly into a crypt, smelling of steel and blood, but not fear. I feel the hunger inside of you. Gnawing at you. You see the dead and your mouth grows wet. Your stomach growls. It's all right. I will not shun you for what you are. Stay. I will tell you everything you have forgotten." She will then appear from nowhere and speak normally, saying, "You were young when you first tasted human flesh, weren't you? A brother or sister had died? An accident, of course. Then the hunger set in. Curiosity. What's the harm in just one bite? It's okay, now. You've found a friend who understands you. You can let go of your guilt." At this point, you will have three choices. If you ask her about your supposed 'guilt', or if you claim you are not a cannibal, she will continue her seductive behavior: "A lot of our kind block out the memory of their first meal. The shame is too much. But you don't need to hide anymore. Namira, the Lady of Decay, accepts you for what you are. She has a place for us, where we can sate our appetites without judgment." Choosing the third option and saying that her tricks won't work on you will have her yell, "To Oblivion with you then!" This will cause her to attack you right away, with no option to yield and you will fail the quest. After the first speech, two new options are available. 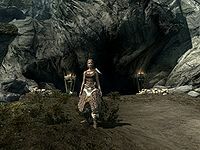 If you ask her for the location of Namira she will say: "It's inside Reachcliff Cave. But the dead have stirred from their slumber recently, and I was forced here. Meet me there. We will fight our way to Namira's embrace together." If you try to reject helping her she will instead say: "Very well. But should the hunger call out to you, I'll be waiting outside Reachcliff Cave." In both cases she will send you back to Brother Verulus with a comforting: "Until then, tell the people of Markarth that their dead won't be disturbed, anymore. We have bigger plans ahead." She will then cast an invisibility spell on herself, utter, "Not here. We will meet at Reachcliff Cave." and run all the way to Reachcliff Cave southeast of Markarth. Once there, she will patiently await your arrival. When you arrive near the entrance, she will actively seek you out and say, "You've come. The draugr infesting Namira's sanctuary are inside." You can choose to ask her to follow you, which will make her say, "I was hoping you would say that." If you ask her to wait, she will say, "Then I'll wait." and stay behind. Should you approach her again, she will remind you of the task: "Clear Namira's sanctuary of the undead." 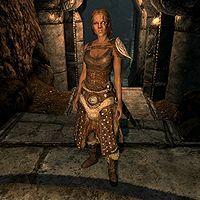 If you asked her to follow you, she will help wipe out the residing draugr enemies, while shouting out random battle cries: "Namira grind your bones for my bread! ", "I will drink your blood and feast on your flesh! ", "I will feast on you! ", "Glory to Namira! " and "Glory to the repulsive!" When the final draugr is slain, Eola will once again approach you, saying, "You've done it. The shrine is ours again. Now we need to prepare a grand feast to welcome you to Namira's coven. You will have the honor of bringing a fresh kill for the main course. And I know the perfect person." Regardless of your choice of response, she will describe the perfect feast: "A priest, filled with the taste of an easy life. Brother Verulus, from Markarth. Give him this gold. Tell him you need Arkay's help exploring an old cavern for treasure. And when he stands in Namira's presence, she will take care of the rest." Talk to her again and she will repeat, "Bring Verulus here. The Lady of Decay will do the rest." She may also briefly explain, "Many used to come to these caves. The forgotten. The wretched." "I've invited you to dinner." Verulus: "Who... who are you? What's going on?" Eola: "Priest of Arkay. I'm your friend." Eola: "Yes. I'm your friend, and I've invited you to dinner." Verulus: "I've been invited to dinner.... I'm so hungry...."
Eola: "Why don't you lay down and rest, while we get the meal ready?" Verulus: "I need to lay down. I'll just be a minute...."
Eola: "Come with me. Our feast is about to begin." Eola: "The meal is on Namira's table. Go ahead. Carve." After the conversation, a hypnotized Brother Verulus will lie down on the altar and sleep. When approached, Eola will say, "The meal is on Namira's table. Go ahead. Carve." and "Don't be shy. You should be the one to carve." and expect you to carry out the task. When Verulus is dead, she will invite you with, "He looks so... sweet. Go ahead. Have the first bite." and "This is your initiation into the coven. Go ahead. Have the first bite." After your conversation with Namira, she will be quite impressed and say, "I knew when you walked into the Hall of the Dead that you were special. And here you are. Champion of Namira. Keeper of her ring. You're everything I hoped you would be." If you tell her you feel sick after the bizarre 'meal', she will comfort you: "There, there. It will pass. Going too long without a proper meal can make the stomach weak. Feel free to stay and mingle with your new coven, if you have the strength." If you thank her for the initiation she will say, "It's an honor, champion. Feel free to stay and mingle with your new coven." She will then head down to the dinner table, staring at the participants. At this point, you can ask her if she started the coven: "No. This coven has existed for thousands of years. Namira is a goddess. She has been worshipped since time began. I'm honored to be leading the latest generation of Namira's faithful. Those who have embraced what they are." Eola: "Not too full on bread and wine, I hope?" Eola: "Thank you for coming to dinner, Hogni." Lisbet: "This is lovely, as always, Eola." Banning: "I always leave room for the main course, Eola." Hogni: "I never miss a good meal." Eola: "Thank you, Lisbet. It's been such a joy to dine with you all these years." Eola is referred to as Glooredhel by the Creation Kit, indicating her name was changed during development. As a follower, Eola may not attack anyone, but rather just stand nearby. ? The sound files for her response to you asking her to do something are missing. When you meet Eola at Reachcliff Cave and tell her to wait, she'll continuously force conversations on you, making it difficult to enter the cave. This page was last modified on 31 May 2016, at 18:47.